Founded in June 2011, the Center for Interdisciplinary Polish Studies (ZIP) at the European University Viadrina (EUV) constitutes the core of a research field whose foundational vision is the broad and diverse examination of Poland. Aimed at interdisciplinarity, the Center explores Poland’s past and present culturally, legally, economically and politically through academic studies, themed events, publications and public discussions. 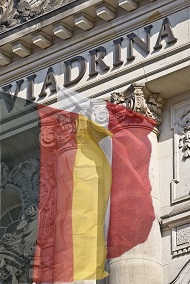 In addition to the ZIP newly established chair, the Center’s profile is influenced and supported by existing departments and chairs at the Viadrina and at the Collegium Polonicum, whose focus on Poland have won the Viadrina international recognition since its re-establishment in 1991. Interdisciplinary study of Poland is reinforced through conferences, workshops, lectures and seminars by renowned scholars, our own publication series "Interdisciplinary Polish Studies" and the online platform for academic information and international exchanges in Polish Studies Pol-Int, that underlines the special role of the Viadrina as a center of European exchange. Center for Interdisciplinary Polish Studies was established with the financial support of the state of Brandenburg.